Relocating slider boards, clearing clutter or revamping the palliative care process to enhance communications for patients’ families. These are all ideas generated from the Unit Based Teams (UBTs) designed to engage Niagara Health staff to share ways to improve their work areas. Over the next three years, more clinical and clinical-support departments will develop operational, trained UBTs as a way to constantly be implementing new ideas from front-line staff. UBTs were created just before the strategic plan was adopted in 2016, but fit nicely within its structure, falling under Extraordinary Teams. The goal is to encourage the generation of at least two ideas per month, per team. When a UBT is formed, each team member spends two days in performance improvement training, learning how to look for ways to improve upon their current operating practices, and then breaking down those ideas into smaller, manageable, realistic opportunities. UBTs are made up of staff from different disciplines in order to foster coordination and collaboration. They meet regularly to discuss their ideas, share successes, and learn from missed opportunities. Toni, Patient Care Manager in Cardiology, said she saw how successful the initiative can be from the inside out after she was trained and worked within a UBT. Watching an idea grow from an a-ha moment into something that tangibly improves patient care is very rewarding, she said. 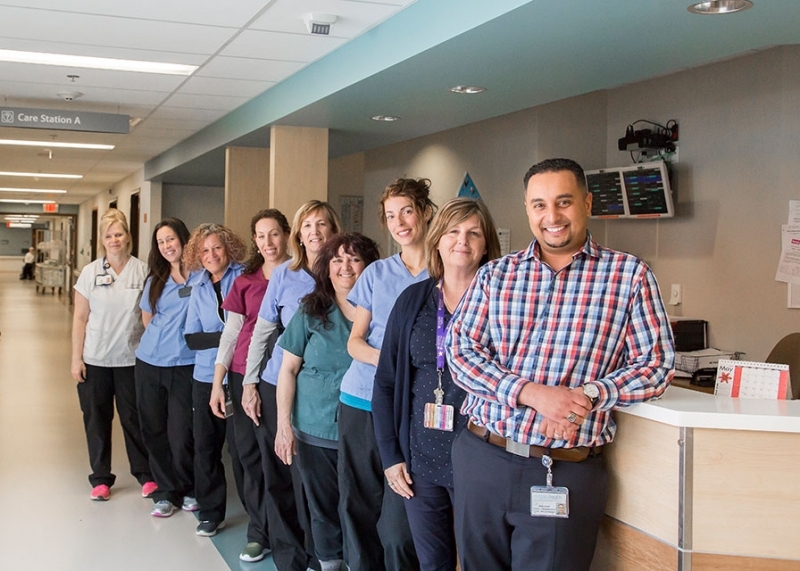 Lynda Chatwin, a Registered Nurse in the Cardiac Care Unit who is on the 2A/2B UBT in St Catharines, says she appreciates the opportunity to drive change in her unit, and sees the UBT initiative as a great team-building experience as well. “It’s a way for us to address issues that are specific to our units, but also issues that we know we have the ability to change,” she said. Lynda's unit is in the process of streamlining and updating the Kardex form that tracks patient information to improve transfers between units – an idea generated from the UBT but has involved feedback from everyone in her unit.